When we moved cross country last year, I had no idea it would take 6 months for us to get our office unpacked and set up with high speed internet. I’m a blogger, people. Bloggers need internet. When we don’t have good internet, we start twitching, and that’s just the beginning of the negative side effects. I got to the end of my rope. Thankfully, it was only another month or so, and we got internet at our house (at last!). But I learned something during that season that I wanted to pass on to you. All of us have goals, passions, callings–those things we both have to and want to do so strongly they fuel our days and keep us up at night. For me, it’s writing and blogging. Also, mothering, and cooking real food for my family. Those are my passions. Yours may be similar, or different, but we all have passions. We also all have limitations. Too little time, lack of energy, other obligations, unforeseen difficulties, poor internet, not enough sleep, too many little children who need lunch right now, emergencies, interruptions, lack of resources, not the right tools…the list is depressingly long and oh, so relate-able, isn’t it? Boom. Surprised you on that one, didn’t I? Don’t worry, I don’t mean this in a vague, overly-spiritualized way. Limitations offer a very tangible and practical gift to our days, and it’s this: They force us to prioritize. When you don’t have time for everything, you’re forced to choose, and which gives you the opportunity to focus on what’s best. It all comes down to content creation, over and over. You don’t have a blog unless you create content. If you’re not on the computer, you’re UnBlogging, which is awesome. But if you are online? You should make content creation the first thing you do. I struggle with this. I want my ducks in a row before I create. I want to bring my inbox to zero, groom my archives, tweak my design (not to mention hanging out on social media talking about writing–ahem). I feel I have no right to that beautiful, empty compose window unless those other things are in order first. But that’s a terrible strategy for a blogger, because no sooner is the inbox empty, but another email plops down in that pretty white space. As soon as you feel you have got your drop down menus all tidy and all your landing pages in order, you will remember another corridor in the entrails of your blog that needs attention. Those are on going tasks and will never BE done, so waiting to write till they are done will keep you from your call to write. So, create first. Assuming you’ve already published a post today or chipped away at that one that may take you a month to publish–whatever content creation looks like for you–the next priority is to cultivate relationships. This is more than skittering around on social media, liking people’s posts. I’m talking about actually reading other people’s words, leaving heart felt comments on posts that move you, personal emails to real people, getting authentic in community with the bloggers you follow and the ones who are following you. This is a tough one when you’re only internet portal is your smart phone–ask me how I know. Sometimes I have given up completely on trying to engage in the online community and resorted to phone calls and snail mail. Crazy, I know. But immensely beneficial to me as a human and a blogger. Real relationships are essential to being an authentic writer and blogger. Don’t skip this. When you have 5 minutes, spend communicating one-on-one with real people, not skimming the surface of your favorite social media feed. No, I don’t mean numbers! (Us bloggers get so caught up on numbers, don’t we?) I mean personal growth. Further education. Developing skills related to your passion. If you’ve already created content and spent time interacting on an authentic level with other human beings, you really ought to use what time you have left to learn something new. Read that ebook you downloaded months ago about being a better writer. Take that mini e-course on graphic design. Listen to that podcast, watch that tutorial on YouTube. Excellence in your calling requires being teachable, and that’s not just a state of mind, but a willingness to invest time in your education.This is one of the hardest things to do as a blogger–admit you’re not good enough yet and make the effort to grow. A committed blogger will continue to grow even when they only have a few hours a month to invest in their education. 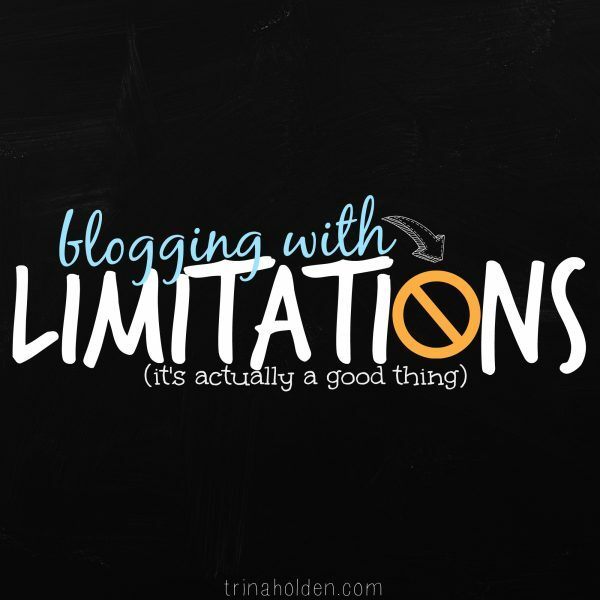 Notice what we’re not doing when we have limitations on our blogging time? We’re not promoting ourselves on a half dozen social media platforms. We’re not pursuing numbers or stats. We don’t have the liberty of endless Pinterest or Facebook scrolling. We don’t have time for that, for those things are not crucial to fulfilling our calling. We’re also not complaining or worrying about our limitations, because the truth for this and every other area of our lives is that God will enable us to accomplish what He has called us to. And the reverse is also true: we will be unable to accomplish those heaps of to-dos that are our own attempts to control the outcome of our blog (or our lives). So let it go, friend. Let it go. Rejoice in your limitations, for they give you the freedom to choose what’s best. Do you feel limitations as you pursue your calling? Have you ever thought that they could be a gift, allowing you to sift things down to the essentials? What was the fruit of that? God has currently put me in a time of rest and I am not able to blog as much. While I wait for the green light, I am busy unfollowing blogs I’ve been compelled to follow over the years and clean up my social media connections so that I can truly focus on the community that I am building through blogging. This is exactly what I needed today, Trina! Thank you for sharing your blogging wisdom. I needed this reminder to ignore things like my inbox. My limitation is definitely time but your words are still spot on. Thank you. As someone who has blogged with many limitations over the years, I can only give a hearty AMEN. Thanks for these needed reminders.